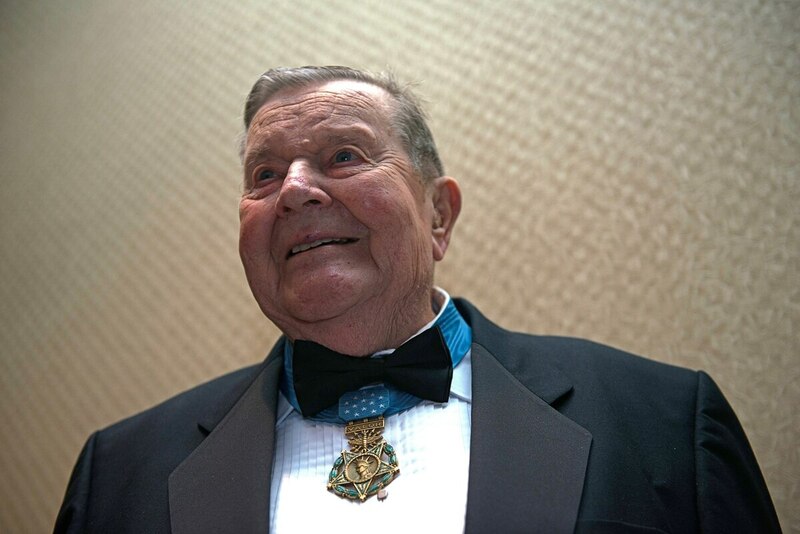 Retired Air Force Col. Joe M. Jackson, a Medal of Honor recipient, veteran of three wars and Air Force legend, has died. His death leaves James P. Fleming as the only other living Air Force Medal of Honor recipient, according to Military Times Hall of Valor Curator Doug Sterner. His exploits saved the lives of three men, but risked his own, as the airfield had been the site of multiple U.S. aircraft shootdowns and aircrew fatalities over the past 24 hours. Although Jackson has passed, his exploits and the significance of the battle he took part in were recorded in the Southeast Asia Monographs, Volume V-7, at the Airpower Research Institute of Maxwell Air Force Base, as well as first-person accounts archived by the Library of Congress. The incident took place on May 12, 1968, at a camp for U.S. Special Forces and South Vietnamese irregular troops called Kham Duc. The base was located 16 kilometers from the Laotian border and surrounded by sweeping mountains on all sides. During the pivotal Tet Offensive, largely seen as a turning point for the American public’s perception of the Vietnam War, Kham Duc came to be surrounded by North Vietnamese Army forces and Viet Cong fighters. The enemy troops were part of a larger assault force that had been repelled by U.S. forces during an attack on Da Nang Air Base. After the battle for Da Nang in early February 1968, the NVA and VC melted back into the jungle and managed to evade U.S. intelligence for several months. In May, the enemy emerged and began attacking outposts surrounding the Special Forces camp and paved runway at Kham Duc. The larger assault began May 11. Although the U.S. had by this point reinforced Kham Duc, the intense attack involving artillery, mortars and recoilless rifles being fired from tall mountains overlooking the base convinced Army Gen. William Westmoreland, commander of U.S. forces in South Vietnam, to order an evacuation. Roughly 1,000 people, including a mix of U.S. soldiers, local allies and civilian family members loyal to the American cause, needed to be airlifted out. The evacuation began the morning of May 12 and involved cargo and helicopter transports, as well as airstrikes around the besieged camp. Jackson was an experienced pilot by the time he arrived in Vietnam. He enlisted in the Army Air Corps during World War II and rose through the ranks from crew chief to pilot through an aviation cadet commissioning program. He flew the P-40 Warhawk and the P-63 Kingcobra during the war. He stayed in the service as it transitioned into the Air Force and flew the F-84 Thunderjet on 107 combat missions during the Korean War. When Vietnam began, Jackson received orders to pilot a C-123 Provider with the 311th Air Commando Squadron. Although the C-130 was quickly becoming the premier airlift provider by this time, the C-123 proved useful for landing in the remote jungles and on the short airstrips dotting the country. Jackson almost didn’t land at Kham Duc on May 12. That morning, eight aircraft had been lost during the evacuation — one of which was a C-130 loaded to the brim with Vietnamese civilians. Jackson didn’t arrive on-station until the afternoon, however. By that point, the evacuation was finishing up, the weather was deteriorating, and the former Special Forces base was littered with burning aircraft wreckage and artillery craters. Except there had been a mistake. As the last C-130 took off with the final group of evacuating personnel, the commander of the airlift ordered airstrikes to be dropped on the abandoned base and its equipment. “Negative, negative!" a C-130 pilot yelled over the radio. He reportedly punctuated his remarks with profanity as he explained that he had just reinserted three airmen on the airfield based on orders from higher up. The cacophony of fighter pilots, cargo aircrews, forward air controllers, and battle-space commanders abruptly ended. The C-130 pilot later remembered that an “unreal” silence fell over the radio waves. Major Gallager, Sergeant Freedman and Sergeant Lundie, the three-man Air Force combat control team that was dropped off to direct airlift in and out of Kham Duc, had been left behind in the confusion. The men had been at the airfield since May 10, but were evacuated earlier in the day on May 12 via a bullet-riddled C-130 after their jeep containing their primary radios had been pummeled by artillery rounds. Not long after evacuating from Kham Duc, the combat control team was ordered back in, despite them being down to only emergency radios. After landing once more, they began searching compounds for personnel to help evacuate, but found no survivors. The airmen didn’t know how close they came to being victims of their own air power, because their radios weren’t working and they couldn’t coordinate with the pilots overhead. “They called that [airstrike] off, sent an observation plane down to see if they could locate them and they weren’t able to,” Jackson said, according to his archived interview in the Library of Congress. At this point, the airmen on the ground — armed with only M-16 rifles and .38 caliber revolvers — were hugging dirt as they watched the North Vietnamese set up .50 caliber machine gun emplacements on either side of the runway, one of which was under the wing of the destroyed C-130. The airmen exchanged fire with the nearest gun emplacement as the enemy tried to load the weapon. They saw an enemy gunner keel over, silencing one of the .50 cals, according to the after-action report of the battle. The other gun continued to fire at them periodically as they watched a second group of North Vietnamese approach from the west end of the runway. The men said that blasts from exploding ammunition dumps began to surround them. The combat controllers recounted in their after-action reports that they were convinced no one would come for them — that it was impossible to land at Kham Duc airfield now that the enemy was upon it. "[I] never felt so lonely in all my life,” Freedman later said. Because the airmen’s radios weren’t reaching the pilots above, the men were convinced they would be considered dead. But unbeknownst to them, two C-123 aircraft were working through the problem. There was one C-123 pilot ahead of Jackson in the airfield’s landing pattern. He was going to fly in first and try to find the lost combat controllers. Just as the pilot took off, the combat controllers came running out of their hiding spot. The enemy fire forced them to dive for cover once again, but the pilot at least saw them. That C-123 was out of fuel, though, so he relayed to Jackson where he had seen the three men and returned to base. Jackson’s crew was up next. Jackson didn’t know how fast they were descending, but he did know his air speed was maxed-out for that configuration at 135 knots. “The rate of descent had hit the limit on the instruments,” he said. “I told the guys I’m not going to reverse the propellers, because to do that would shut down the auxiliary jet engines. And I didn’t want to take time to restart them. ... I said, ‘We’re not going to be on the ground very long.’"
Jackson’s C-123 managed to touch down in the first 100 feet of the runway, stopping exactly opposite the three lost airmen who were taking cover in a ditch. As the airmen jumped in, the co-pilot called out, “Oh, my god, look at that!" The loadmaster yelled back that they were ready for take-off. Jackson hit the throttle, taxied around the unexploded ordnance and flew out of Kham Duc for good. Jackson cruised back to Da Nang Air Base as artillery fire gave way to thunder, and the weather deteriorated over the abandoned U.S. base. Jackson would eventually be awarded the Medal of Honor by President Lyndon B. Johnson on January 16, 1969. After the Vietnam War, he served at the Pentagon and in the Department of Military Strategy at the Air War College until his retirement from the Air Force in 1974 at the rank of colonel. Kham Duc would eventually be reoccupied by U.S. forces, but the initial withdrawal was considered a major defeat for the Americans. Many of the bodies of the Americans who perished at Kham Duc would not be repatriated for several decades. The remains of six airmen from the downed C-130, for instance, weren’t located until the early 1990s. A little while after the fall of Kham Duc, a friend of Jackson’s named Keith Ferris did a painting of the May 12 evacuation. He sent Jackson a slide for critiques on accuracy, to which Jackson replied that it was mostly correct.